Millennials have been the focus of a lot of analysis and discussion in recent years, often to lament their shortcomings and the skills they lack for functioning in society or the workplace. But this generation, raised around technology from day one in a quickly changing world, brings certain skills to the workplace. Whether you’re a hiring manager wondering if a millennial is worth the hire, or if you’re a millennial wondering how to strengthen your resume, read on for what millennials bring to the workplace. According to Pew, millennials are defined as the generation born from 1981 to 1996. This means computers have always been a part of their lives, and for the latter part of the generation, so have the internet and cell phones. Unlike older people, millennials have always used technology at school, at home, and in the workplace. They aren’t afraid to try out new things, or to experiment with new technology trends. They know how to type—they learned it from instant messaging and texting—and they have a knack for figuring out new software and applications that might seem almost scary to older people who need to follow written instructions for any computer program. With technology continuing to increase in importance in the workplace, a millennial’s natural ability to use a variety of software and applications and to learn them quickly means a company will have to invest less time training them on company systems. It also means they can serve as kind of an informal IT department for older employees. Instead of someone having to call the IT Department to fix simple issues or to help explain a basic program, employees might now have a colleague right across the hall they can turn to for help. Millennials reading this – you’ve all had this experience in an office, and it might have annoyed you to be the “go to” technology person, but it helps establish you as a team player and as someone with important skills that benefit the company. Most companies now have a presence on at least Facebook, but if not, it’s important to establish one. LinkedIn, Twitter, and Instagram are all also valuable marketing tools that provide huge reach for a relatively small investment. If you don’t already have an in-house marketing department, or an established social media presence, the millennials in your office are going to be your best resource for getting started and for making sure your efforts are effective. If you’re not ready to hire a social media manager full time, offer it as an additional responsibility to a millennial employee or two whom you have been looking for a way to utilize more effectively. In addition to understanding social media, millennials will also have a better handle on graphics and video creation, as well as things like hashtags that have just been a part of their lives for years. And millennials, if you’re stuck in a rut in a current job and notice that your company has no or a weak social media presence – offer to help with it, if it’s appropriate and if you have time. It will show interest in the company and its success, and give you a way to showcase skills that your colleagues may not even know you have. The millennial resume you received may read that they have a degree in digital marketing, but chances are they’ve held jobs in multiple sectors, or have honed skills well beyond marketing in order to survive in today’s fast-paced business world. People are called on to multitask and hold down varied responsibilities at all levels of a company now, especially those in entry-level positions, which many millennials are still applying for or just emerging beyond. Millennials are also likely to move from job to job far more than generations of the past. While this can be a red flag, especially if they don’t have great recommendations from previous employers, it can also make them a strong employee. If they’ve moved between a few jobs over a few years, they probably moved across different industries where they picked up insights and versatile skillsets, or across different jobs where they picked up different skills. This makes them a valuable employee because they will be flexible and able to shift to meet different needs within the company. An employee with tunnel vision and a very specific, defined set of skills can be valuable and necessary—say, an accountant or an engineer—but in many roles, you will want your employees to adapt as needed to address challenges and find solutions. Millennials are used to adapting, so offering them an opportunity to do something different may be a welcome break from their normal job duties for many of them. It will also be a compliment, as it shows that you trust them to take on added responsibility. As older millennials age into management roles and younger millennials launch their careers, companies need to find ways to utilize all of their skills – even the hidden ones. Ask questions in an interview that suss out what skills they might be hiding, and don’t be afraid to use the millennials you have hired in a way that gets the most out of their skills. 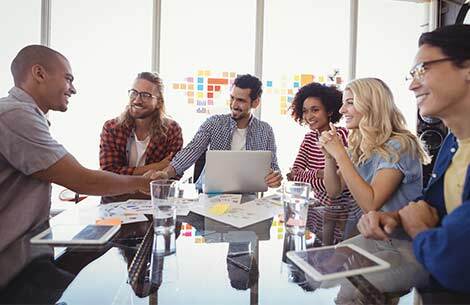 Millennials have gotten a bad rap, but they can bring definite value to your company and help bring it into the 21st century. Millennials, you need to find ways to describe your skills fully in your cover letter, resume, and of course, your LinkedIn page. Emphasize your technology skills even if it isn’t specifically asked that you do so in the job description. Say you’re willing to take on added responsibilities and that you have experience doing so. Be forward, but also be aware of your weaknesses. Learn about workplace etiquette, and step away from your phone during interviews and meetings. Remember that your Facebook page reflects on you, and that hiring managers do search it. Embrace your skills, be an advocate for your talents, and companies will be able to see the value you can bring to them.